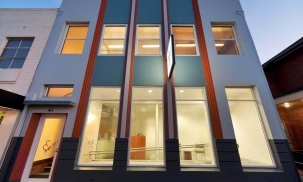 In 2013 the former Duke of Wellington pub in Launceston was transformed from a derelict building into a contemporary specialty centre called Launceston Health Hub. This was a result of the dedication and vision of Dr Jerome Muir Wilson and his team. In 2015 our team was involved in stage 2 of the development being a suite of specialist consulting rooms on the first floor. Later in 2015, due to the popularity of the Health Hub and as a result of increased demand for their services, Dr Muir Wilson and project managers Commercial Project Delivery engaged 6ty° Architecture to develop a masterplan for the site. The masterplan developed by our team focused on maximising the potential floor space for expansion of the Launceston Medical Centre and maximum lettable area to provide additional allied health tenancies. Of important consideration was the need to maintain the prominant Wellington Street entrance but provide access through the site to an expansion of the carpark at the rear with secondary improved access to and from Cleveland Street. The masterplanning process led our architects to propose a three storey extension at the rear of the existing building. A vehicle ramp, partially enclosed by building over, provides access to the upper car park. The ground floor design was a major expansion of the Launceston Medical Centre which was to merge with Launceston's Parkview Medical Practice. The topography of the site meant deep excavations into the existing bank and therefore the ground floor extension had very limited access to daylight. Our response to this was to form a large glass roofed atrium as a core to the extension providing an abundance of natural light into the medical centre. The first floor provided an opportunity for a main entry from the rear carpark. The entrance leads patients into the light filled atrium with direct access into the Health Hub Specialists and future allied health tenancies, as well as lift access to the ground level medical centre. The lift also provides access to a future second floor level which will accommodate further allied tenancies of over 1,000m2 with the option of an independent entry at the upper end of the carpark. 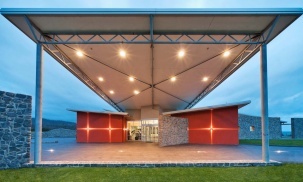 The expansion of the Launceston Medical Centre includes nine additional consulting rooms, an education/treatment room, conference room, centralised reception/administration hub, cafe, two waiting areas, collection rooms for Tasmanian Medical Laboratories, as well as staff and patient amenities. 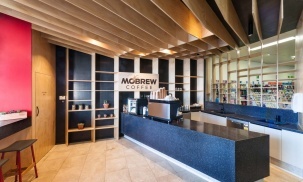 The main waiting area sits below the central atrium creating an open, accessible and inviting space. The consulting rooms are spread around the perimeter of the extension with privacy glass fronts allowing these rooms to share the natural light. Construction of the upper levels is ongoing and the removal of hoardings and opening of the main atrium will bring this project to full light.